A doorbell to ring for assistance with the door. An automated door that opens by pushing a button. An automated door that opens via a sensor, like those in grocery stores. All three options achieve the same outcome: the door is opened. However, the degree of accessibility varies: the doorbell option requires waiting for an employee to come open the door; the button-operated door opener requires enough arm movement and hand function to press the button; the motion-sensing door opener works for anyone within the area of the sensors – no further action is required. Obviously the third option is more accessible than the first and would be provided in an ideal world. Although, in a pinch, the doorbell might be all that can be provided. Taking this concrete example to online…the internationally-recognized Web Content Accessibility Guidelines 2.0 outlines three levels of accessibility: Level A, Level AA and Level AAA. As with the door opener example, conformance with the Level AAA guidelines, if correctly implemented, means a website or blog accessible to more people than a Level A compliant site. The “click here” links make sense when read with the rest of the sentence or, in other words, when read in context – a Level A guideline. Where the links are “pictures, click here”, “presentations, click here”, and “videos, click here” are the links…these links then make sense when read alone, when read out of context – a Level AAA guideline. By rewording your hyperlinks so they make sense out of context, you are increasing your blog from a minimal level to an optimal level of accessibility (in terms of links). 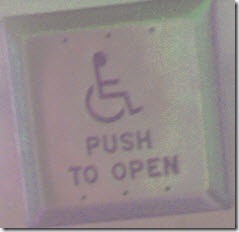 Keep in mind that accessibility is not an absolute, but rather a continuum. Where possible, strive for the more, higher, optimal end of accessibility, and you open the door to more people able to read and participate on your blog.